How montonous the sounds of the forest would be if the music came only from the Top Ten birds. The Wrentit, Chamaea fasciata, is a small bird that lives in chaparral and bushland. It is the only species in the genus Chamaea. 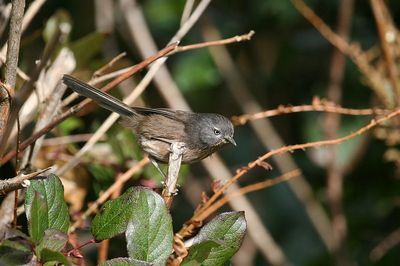 The Wrentit is a sedentary (non-migratory) resident of a narrow strip of coastal habitat in western coast of North America, being found from Oregon south to Baja California. Long tail and dark brown plumage make the wrentit unlikely to be confused with any other bird. Wrentits mate for life, forming pair bonds only a few months after hatching. Chamaea fasciata, Dan Bennett, Dan Bennett quotation, Forest, Wrentit. Bookmark.